Bangladesh has come a long way since it inherited a war-ravaged economy. It is now acclaimed as a star performer in relation to poverty reduction, child mortality reduction, infant mortality reduction, achieving gender parity in primary and secondary education, and meeting certain other targets under different MDGs, while remaining on course for several others. Foreign remittance and foreign exchange reserve have reached record levels, respectively close to US$15 billion annually and US$31.16 billion in August 2016. Bangladesh is now the second largest exporter of readymade garments; and ICT has already penetrated notably throughout the country. The country has been identified as one of the next eleven (which include, among others, Indonesia, Mexico, Nigeria, Turkey, South Korea, and Vietnam), poised for development miracle after BRICS (Brazil, India, China, and South Africa). 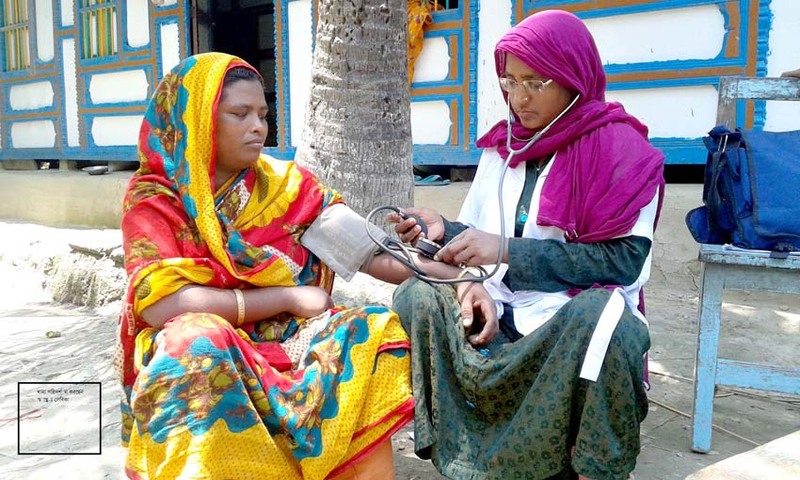 Despite persisting political unrest, Bangladesh has achieved enviable socio-economic progress. Indeed, over the past seven or eight years, Bangladesh has been able to achieve an average annual GDP growth rate of over 6% and topped 7% in 2015-16, despite a global financial meltdown followed by a global recession starting in 2008. The country now produces enough foodgrains to meet the requirements of all citizens. Moreover, recently, Bangladesh has joined the ranks of rice exporting countries, albeit initially in a small way. These results have been achieved under a conducive macro policy and institutional framework provided by the Government. This has been particularly so over the past several years. Hard work of the farmers, agricultural workers, garment workers, other workers, entrepreneurs and business people, Bangladeshis working abroad and sending back remittances, and all others in different fields of work has contributed towards the highly acclaimed socio-economic successes achieved. 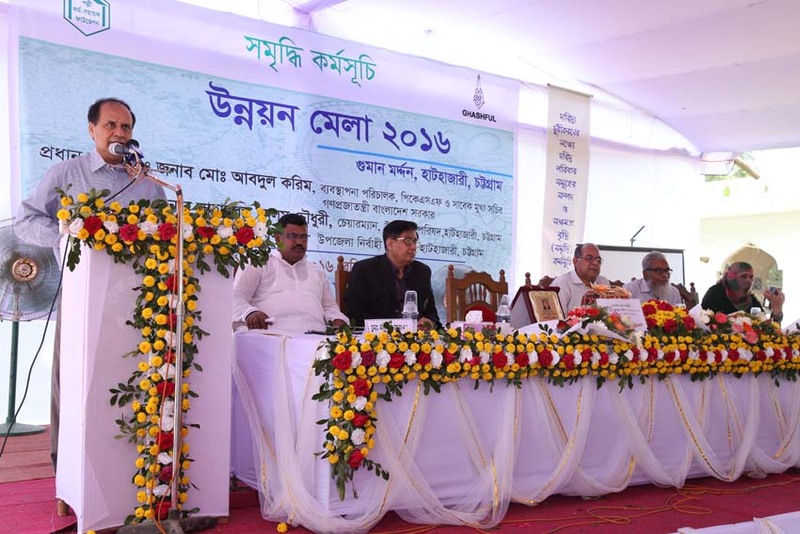 One of the important aspects of Bangladesh’s recent economic progress and strength is a flourishing rural economy, covering both agricultural and non-agricultural activities including enterprise development. 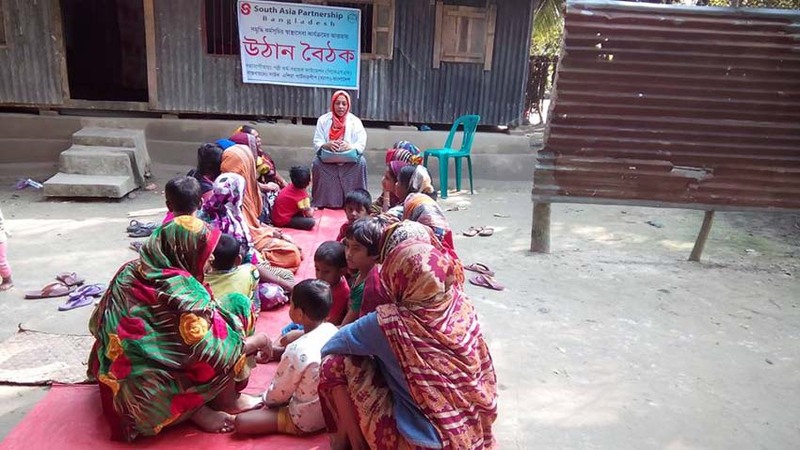 As of 2015-16, both poverty and extreme poverty ratios are significantly down to 20.3% and 11.4% respectively, as estimated by the General Economics Division (GED) of the Planning Commission, Ministry of Planning, Government of Bangladesh. But, still, in terms of numbers of people, poverty afflicts about 36 million and extreme poverty over 18 million. In terms of multidimensional poverty, both the figures will be substantially higher. Multidimensionality has to do with various aspects of human living and, hence, of poverty such as income, education, health services, housing condition, access to drinking water, access to electricity, access to skill training, and access to employment. Also, malnutrition and under-nutrition are widespread and so is unemployment among the youth in particular, especially among the educated youth. Human capability development through education, skill training, and health services, particularly among the people at large, remains a major challenge. Another major challenge is the impact of natural disasters which are increasing in terms of both frequency and devastation in the wake of intensifying global climate change. The Palli Karma-Sahayak Foundation (PKSF) is helping address these and other challenges faced by people at large and consolidate the gains and further accelerate poverty reduction, leading to sustained beyond-poverty development, particularly through a programme initiated in 2010: ‘Enhancing Resources and Increasing Capacities of the Poor Households Towards Elimination of their Poverty’ (ENRICH). Poverty reduction under the ENRICH is not only with reference to the cost of basic needs-based poverty line. It takes into account multiple dimensions of poverty, including a wide range of economic, social, and environmental indicators; and addresses them in an integrated fashion. The concept, the key components, and methods of implementation of the ENRICH are briefly discussed in this paper. 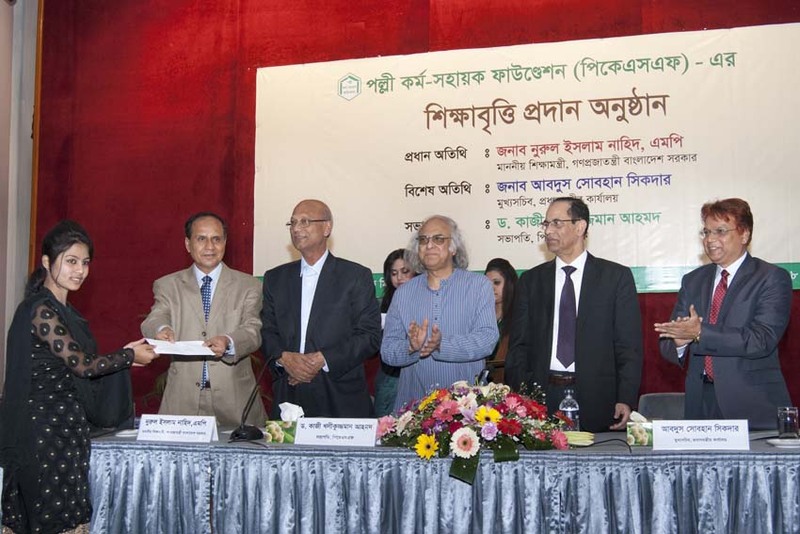 It may be noted that the PKSF is a public sector foundation established by the Government of Bangladesh in 1990 as a not-for-profit organization. The overall mandate of the PKSF may be succinctly put as: sustainable poverty reduction and socio-economic progress through sustainable employment generation and people’s capability development. In terms of its action framework, credit is mentioned in the PKSF’s Memorandum of Association as a tool side by side with a number of non-financial key services including education, training, health services, and livelihood interventions. But, there is no mention at all of microcredit. Perhaps, the intention has been to provide credit, as appropriate (micro or larger) along with other services. This is certainly my interpretation. Yet, given the dominant thinking in the country at the time it was established, the PKSF was in practice turned into a funding source for microcredit alone. Not only that the PKSF’s overall mandate was ignored, the pathway followed has been of little avail, be it in relation to poverty reduction or significant positive impact on income or social well-being of the micro borrowers. Research findings of, for example, Ahmad (ed., 2007) and Zohir (2010) show that meaningful poverty reduction is not possible through microcredit alone. To be sure, microcredit is a small amount of money lent for a year and repayable in weekly installments. 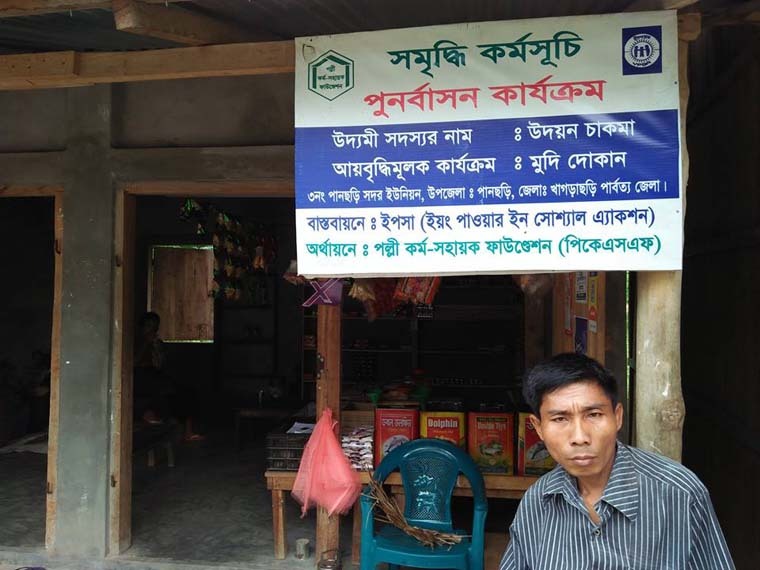 These studies indicate that less than 10% of microcredit-taking poor households could rise above poverty line in Bangladesh. Of the others, there are also those whose income has surely increased somewhat but remained below the poverty line income. Moreover, other aspects of human development have generally been kept out of direct focus of microcredit. Policy Bulletin dated February 2015 of J-PAL and IPA reports that seven randomized evaluations conducted in seven countries (Bosnia and Herzegovina, India, Mexico, Mongolia, Ethiopia, Morocco, Philippines) from four continents have found little positive impact of microcredit. None of the seven studies has found a significant positive impact of microcredit on average household income of the borrowers. Also, no evidence has been found that access to microcredit has had much positive effect on women’s empowerment or investment in children’s education. It has been found, though, that access to microcredit has given the borrowers some freedom to choose what business to pursue. But, expanded access to credit has been found to allow the borrowers some flexibility in terms of undertaking more potential income earning activities. But, up until 2009, the PKSF, despite the introduction of some diversifications in its microcredit activities and some innovations in its approach, essentially remained a source of funding for the Partner Organizations (POs) to provide microcredit. Its overall mandate remained by and large ignored. It may be noted that the PKSF does not work directly with the people. It implements action programmes through carefully selected NGOs, called Partner Organizations (POs). After taking over as chairman of PKSF in November 2009, I became deeply concerned about things as they stood and started thinking about formulating an approach that will be in keeping with the PKSF’s overall mandate and ensure sustainable poverty reduction and human development. In fact, the idea of household-based total development by assigning one union (the lowest government administrative unit) to one PO crossed my mind as I lay in a hospital bed after a surgery in the first week of February 2010. The idea of ‘one PO-one Union’ has since flourished into what has come to be known as the ENRICH. When, on return from the hospital, I broached the idea with the senior officials of the PKSF and gave them an outline as to how may it be shaped and implemented, they found it a worthwhile, even an exciting idea. The enthusiasm and dedication with which they worked out the details, regularly discussing various aspects with me, filled me with hope and expectation as we embarked on this path. In the meantime, extensive consultations were held with POs of the PKSF and experts on rural development, as the proposal was being prepared. After a few months, the proposal was approved by the PKSF Governing Body and we were implementing the ENRICH in 21 unions initially. Since then, a period of five years and a half has passed and the ENRICH has been expanded to cover other unions. The total number of unions, with full ENRICH activities, is now 150, brought under the ENRICH in 3 phases. In the first phase, 43 unions were included in 3 batches (21+14+8). It was extended to another 100 unions in the second phase and yet another 7 unions in the third phase. Initially, five components were implemented in the 107 unions selected in the second and third phases: education, skill training, primary healthcare services, improved nutrition, and awareness building relating to social evils and injustices. But, now all the components of the ENRICH are implemented in all the ENRICH unions. The overall vision that underpins the ENRICH is to work with the poor to create an enabling environment for them to achieve a humanly dignified living standard and enjoy universal human rights. The poor who join the ENRICH are in fact partners in the process; and the PKSF and the POs work with those people, not for them. The ENRICH is not about one project here and another there. It is an integrated approach and truly a paradigm shift. 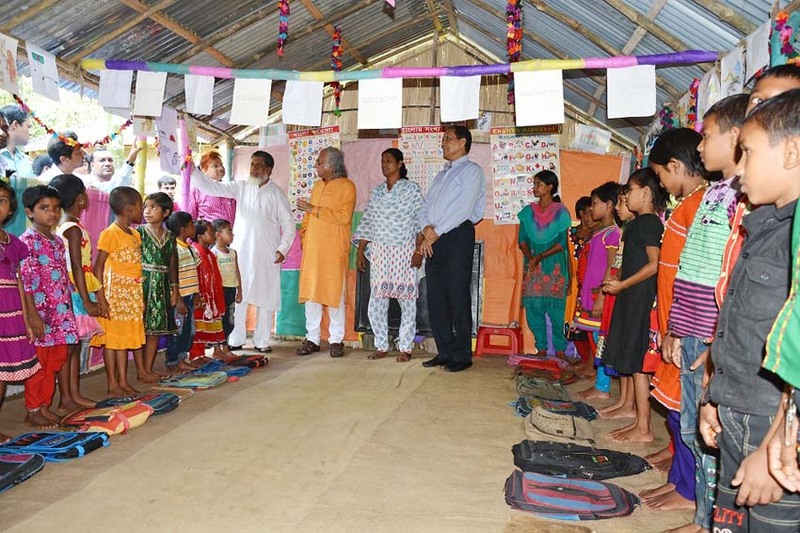 Nobel Laureate Poet Rabindranath Tagore has underlined in many of his writings that the recipients of services must be brought into partnership, imbibed with the feeling that they deserve what is given to them. Those who are providing various services, for which they are compensated, must consider themselves as performing their duties in a partnership characterized by human ideals. The ENRICH is an endeavour aimed at restoring people’s confidence unto themselves and flowering of their innate abilities to achieve a life of human dignity and freedom. Hence, by the manner in which it works, the ENRICH is helping the people’s inherent abilities to flourish so that they are endowed with the key to their progress to that end. With renewed confidence and hope, the poor, then, move ahead and break free from the shackles of multidimensional poverty and indignity and achieve living standards characterized by human freedom and dignity, along with material uplift. The ENRICH facilitates the best utilization of the existing capabilities and resources of the poor households and, at the same time, supports enhancement of their capabilities and resource-base in order to enable them to move ahead steadily. In so doing it seeks to advance the causes of the participants, resolve the bottlenecks faced by them, and create opportunities and facilities for them to internalize the lessons learnt from the experiences gathered along the way, introduce innovations, take calculated risks, and always push the boundaries of achievements. Under this new approach, the integrated action programme includes the key components of education, skill training, technology, information, health services, food security and nutrition, awareness raising, facilitating access to asset, social capital formation, infrastructure, climate change adaptation, insurance services, market linkages and so on, along with appropriate levels of funding for the ENRICH participants to implement their planned socio-economic and environmental protection related activities. As a matter of fact, education and health services are now essential elements of all PKSF supported programmes, in addition to the ENRICH. Also, skill training, enhanced financing up to Bangladesh Taka (BDT) one million (US$12,820) if found appropriate, encouraging and facilitating use of improved technologies, promoting innovations, and marketing assistance are now, taking cue from the ENRICH, increasingly being introduced in all PKSF supported programmes implemented by the POs. In other words, enterprise development is encouraged and supported in all PKSF programmes, including the ENRICH. This is done, while poverty reduction remains the focus for poverty-stricken families, through increased capability development and self and wage employment generation. The ENRICH is implemented in each selected union by the PKSF, the selected PO, the union parishad, and the people joining the programme (members) in a unique kind of partnership, that specifies differentiated responsibilities for the partners.Broadly, the PKSF provides the framework, guidelines, and finances; designs and supports non-financial services; and monitors progress. The PO implements the programme by working with the households included in the ENRICH. The households play a key role in planning what they do in terms of socio-economic activities, in consultation with the PO and, at times, PKSF representatives. The union parishad plays an advisory role and facilitates the work as and when necessary. The underlying dynamics of the ENRICH are that the PKSF, the PO, the union parishad and other concerned service providers work with the people joining the programme to empower them to take charge of their own destiny. Hence, it is important that the people themselves are fully committed to shaping their own future. Awareness-raising among the people is, therefore, an important ENRICH-activity to help the people make that commitment and work accordingly. Indeed, the fundamental principles underpinning the ENRICH include: freedom from all ‘un-freedoms’, freedom of choice, equity, inclusiveness, human rights, solidarity, respect for nature, shared vision and responsibility, and access to adequate financial and necessary non-financial services and facilities. The programme is human being-centric and flexible. Innovations and appropriate modifications, based on differing ground realities, relevant experiences, and new ideas are encouraged. Human dignity of everybody is the ultimate goal. The ENRICH initially focuses on ultra-poor and poor households, with monthly household incomes of up to BDT 5,000 (US$64) and between BDT 5,000+ (US$64+) and BDT 5,800 (US$74) respectively. Tenuously placed non-poor households are also considered for inclusion. In addition to the focus on the eradication of their poverty, facilities are created and services offered, as and when appropriate, for their beyond poverty progress towards sustainable humanly dignified living. In fact, educational assistance and health services are provided to all the households of each union under ENRICH. All other components are applicable to eligible households determined following the criteria specified above. 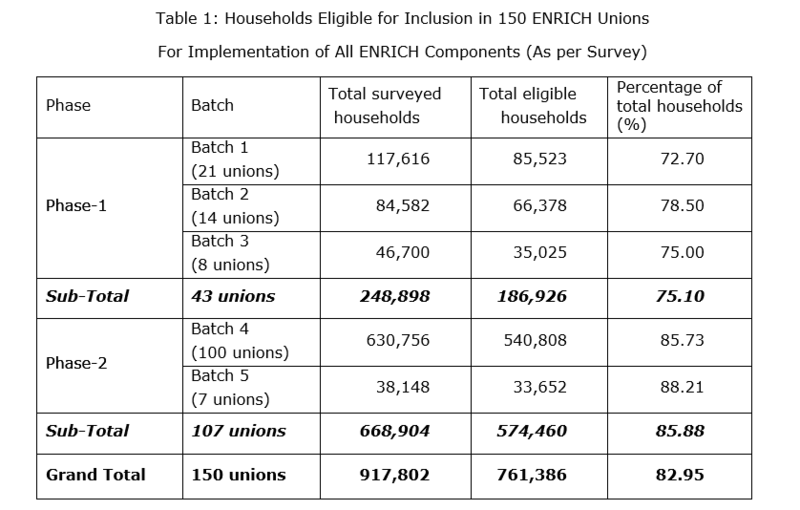 A total of 185,752 (75%) households have been found eligible for all ENRICH interventions in the 43 unions selected in phase 1 for full ENRICH implementation (Table 1). The Table also shows the total number of households eligible for all ENRICH components in all 150 unions. The ENRICH activities are broadly at two levels: household and community. Armed with the data generated through the household survey, the ENRICH officials sit with the members of each eligible household included in the programme to prepare a household development plan, identifying the specific constraints the particular household faces, the specific expectations the members espouse, and the support the household needs to overcome the constraints and fulfill the expectations. The broad areas include: primary healthcare services for the members of the household, education of children, skill training, financial services to facilitate sustainable income generating activities (IGA), livelihood improvement, food and nutrition security, asset creation and asset utilization, and social awareness. The household-specific planning exercise is carried out within the overall ENRICH framework, giving due importance to the views of the members of the household. In addition, each household benefits from the generic actions undertaken in the union within the framework of ENRICH. 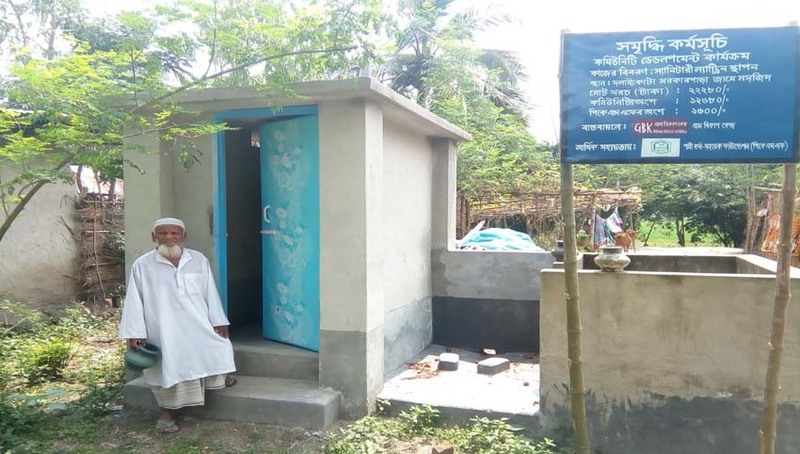 Under community-level interventions, the problems faced by a community in the union or, indeed, by the whole union are identified, which may include: need for tubewells and sanitary latrines at public places (schools, colleges, mosques, temples, library, etc. 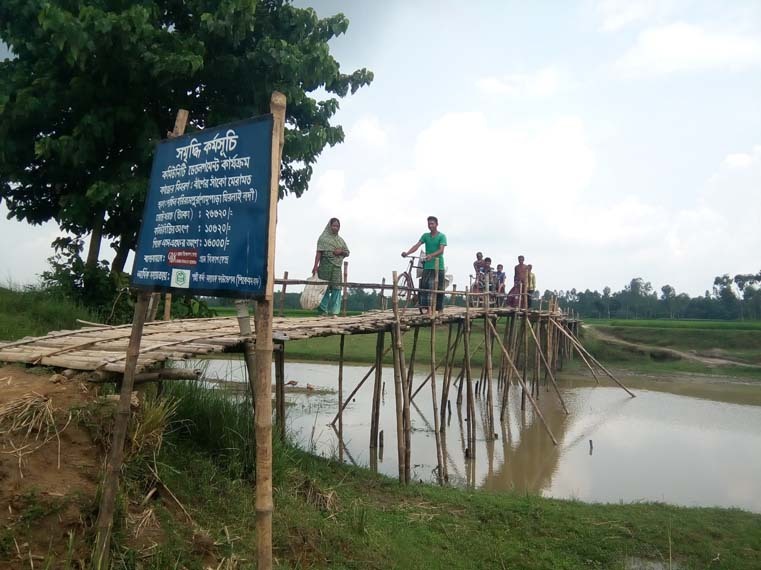 ), problems relating to access to clean drinking water, need for small bridges and culverts for public use, lack of community awareness or capacity for immediate response to natural disasters, and so on. The ENRICH by itself does not address all such problems. It does whatever is within its means, and sensitizes and canvasses the appropriate service providers for action concerning the activities that are within their respective purview; and usually that works. Currently, a total of 111 PKSF-POs are implementing the ENRICH programme in 150 unions in different parts of the country through 258 active branches set up by the POs for the purpose. And a total of 747 personnel are working in these branches. Let me give here some details regarding some of the key ENRICH components, implemented within an integrated framework. This will give a fairly clear idea as to what the ENRICH is, what it purports to achieve, and how has it been performing so far. The ENRICH health component is designed to provide comprehensive primary healthcare services to all the households in the selected unions. Each household is visited at least once a month by a health visitor to collect health related information about all its members. The collected information and data are recorded in the household health-card and also entered into a computer database established for the purpose. 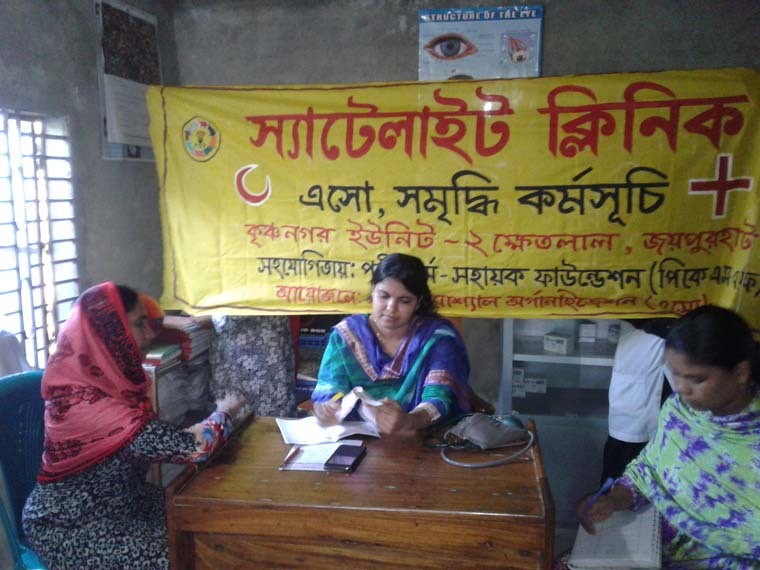 The field work is supervised by health assistants. The health assistants conduct static clinics in the ENRICH office every day to attend to patients, usually advised by health visitors to go there. For patients needing further treatment are advised to visit the satellite clinics held once a week in each ward, with MBBS doctors attending to patients there. There is also referral arrangement with both public and private hospitals and clinics for the patients who need specialized medical services. Costs are substantially subsidized; and for the very poor, services are provided free of cost. 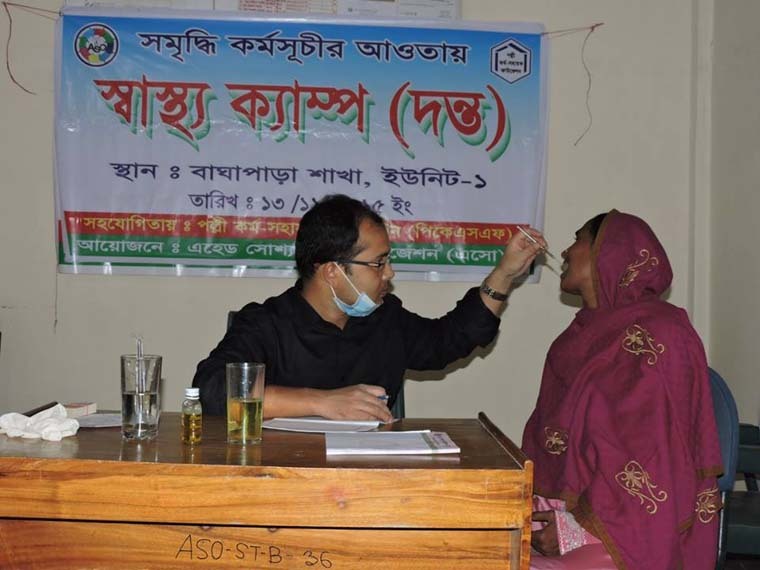 Health camps (vision, dental, heart, diabetes, etc) are also organized under the ENRICH as and when required, with specialist doctors attending. In these camps, patients with serious ailments are referred to different public and private hospitals and clinics where their treatment is arranged free of cost or at a nominal cost. The ENRICH has also launched a deworming campaign, giving away free medicine to 100% of its registered households, covering all household members above 5 years of age. Under the ENRICH, the health component is being implemented in all 150 unions covering all the households therein. The following data relate to all 150 unions. There are now 258 health assistants and 1,842 health visitors. A total of 6,24,436 households have acquired health cards up to December 2016. Also, up to December-2016, 12,50,940 and 10,41,763 patients have been treated in static and satellite clinics respectively, and 1,623 health camps have been conducted treating 3,12,549 patients and performing cataract operation on 15,818 persons. 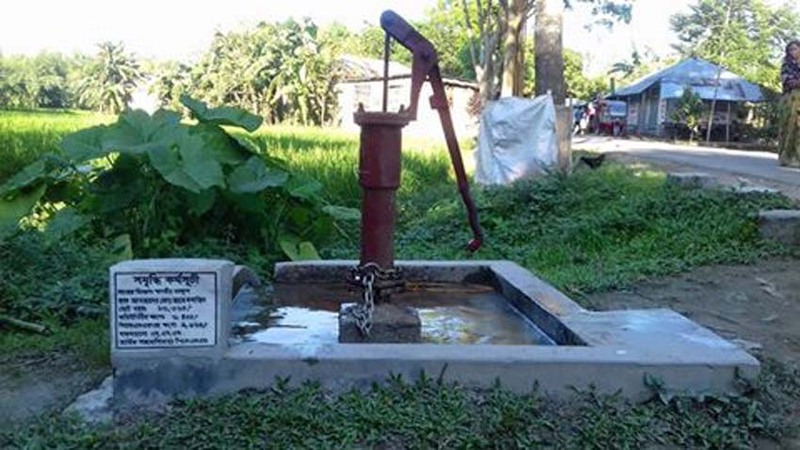 A sanitation component to ensure 100 percent safe sanitation has been initiated under the ENRICH. So far, sanitary latrines have been installed in all homes in 11 unions. The same will be ensured in other ENRICH unions in phases. Other aspects of sanitation are also being promoted in all the ENRICH unions. Distribution of a health and environment-friendly improved cooking stove, commonly known as bandhu chula, is another distinctive initiative under the ENRICH. The households are encouraged and facilitated to replace conventional cooking methods with bandhu chula. It substantially reduces the risk of smoke-related health hazards and exposure to fire for women who cook for the family. Under this initiative, cooking stoves are supplied to the households at substantially reduced prices. As of December 2016, a total of 29,562 bandhu chulas have been distributed in various ENRICH unions. 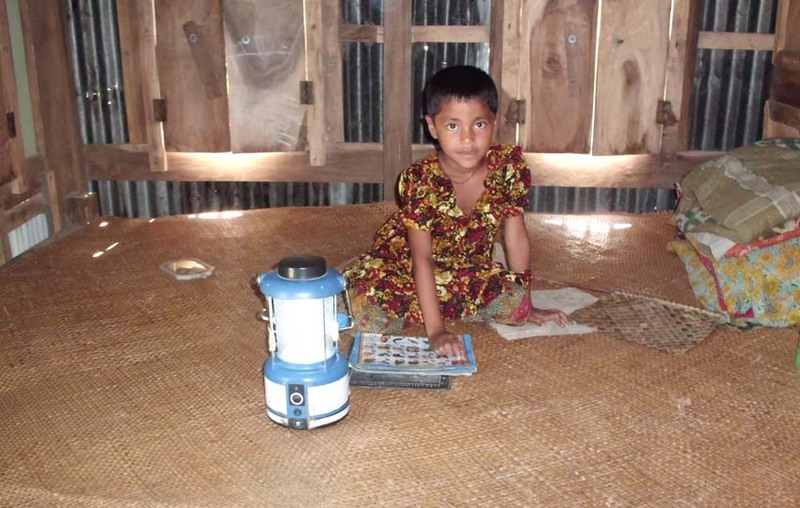 Solar lanterns are being distributed to ENRICH households, particularly for children to use while studying at night. Solar home systems are being installed in households in those areas of the ENRICH unions where grid power supply is not available. This reduces the risk of smoke-related health hazards and fire related accidents and facilitates access of households to light at night. Under this initiative, the POs collect solar home systems from different manufacturers and distribute them to the households at reduced prices. A total of 52,388 solar home systems have been distributed up to December2016 in various ENRICH unions. The ENRICH education component primarily seeks to address the problem of drop-out of children from primary level education. This is implemented in all 150 ENRICH unions; and this service is available to all the households in all the unions. 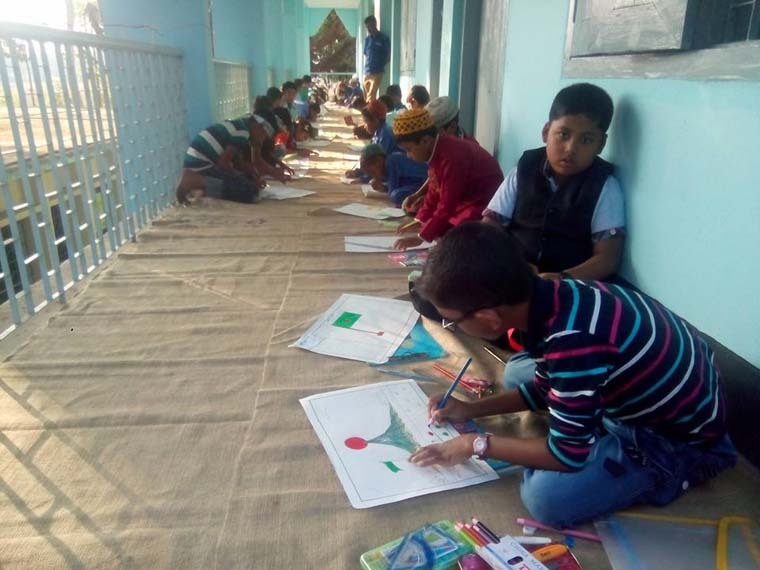 Under this component, at least students up to Class 2 are helped in the educational assistance centres to prepare the next day’s tasks, given that there are no facilities and educational support for many students at their homes. Gradually, these centres will accommodate students up to Class 5. These centres operate from 3PM to 5PM every day except Friday. 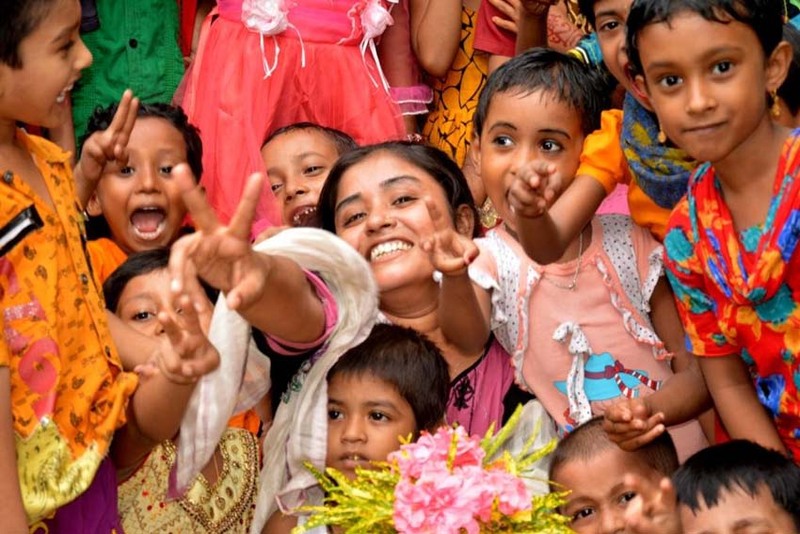 Children come to these centres after attending their regular schools. Children are not only helped with their studies but also assisted in extra-curricular activities such as recitation of poems, dance, singing etc. Also, the children are treated in a friendly manner. They therefore find these centres very attractive to attend. These centres take special care of the students who are generally slow learners and need the extra help and time to grasp the material taught at their regular schools. Teachers are locally recruited. Anyone less than 35 years of age with a minimum of SSC level education is prima facie qualified to be a teacher; most of the teachers are female. These educational assistance centres also monitor if the children attending the centres go to their schools regularly. In the 5,000 afternoon educational assistance centres in the 150 ENRICH unions, 5,000 teachers have been assisting 142,386 students (girls and boys), as of December 2016. The dropout rate among these students, as they move up to Class 3, has, on average, come down to about 0.5%, while it is about 4.5% nationwide. In addition, the PKSF also provides scholarships usually to students at levels after the completion of SSC (Secondary School Certificate), from its Programme Support Fund (PSF). This scholarship component is managed by the ENRICH Unit. 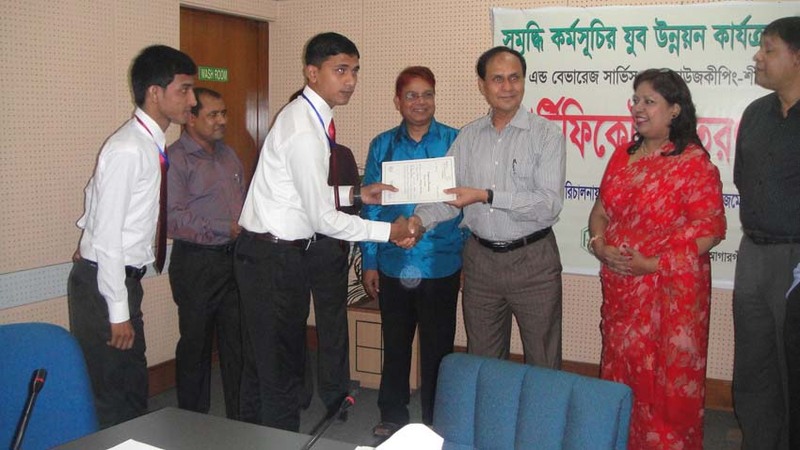 Meritorious children of the disadvantaged or low income parents involved in different programmes of the PKSF, who, after successfully completing Secondary School Certificate (SSC) level, are studying for Higher Secondary Certificate (HSC) or are at a higher level are eligible for this scholarship. This scholarship programme was initiated in 2012 and, up to December 2016, a total of 3,103 students have been awarded scholarships (182 in 2012, 433 in 2013, 950 in 2014, and 1,038 in 2015). Out of these 3,103 scholarship recipients, 1,400 are girls and 1,703 boys. Campaigns against social evils such as drug addiction child marriage, child labour, teasing of girls and women, dowry, violence against women, trafficking of women and children etc. are a major thrust area under the ENRICH. The campaigns are conducted using specially prepared posters, booklets, songs, video clips, and group meetings. The ENRICH also promotes women’s rights. For instance, it is consciously and purposefully sought to ensure that women are in control or are major partners in the management of financial and other support provided to them. There is already a marked improvement in this regard in the ENRICH unions. Three types of special credit services have been designed for the ENRICH households: Income Generating Activities Loan (IGAL), Livelihood Improvement Loan (LIL), and Asset Creation Loan (ACL). All the three credit services can be accessed simultaneously by a household. Under IGAL, eligible household members can take loans for more than one activity and for expansion of an activity to increase their income. In this context, economic activities with potential for productivity growth are selected. Training for skill development and upgrading, marketing assistance, and other necessary services are now routinely provided. As of now the ceiling of this loan is BDT one million (US$12,820) and the maximum service charge is 25% on a declining balance method. The LIL is made available for repairing houses, the purchase of necessary household gadgets, and taking other actions related to livelihood improvement including defraying expenses for social functions such as the marriage of a daughter or a son. In this case, the ceiling for a household is BDT 10,000 (US$128) and the servicing charge payable is 8% (on the basis of declining balance method). The ACL is designed to assist a household in acquiring any kind of productive asset. The ACL ceiling for a household is BDT 30,000 (US$385) and the servicing charge payable is 8% (on the basis of declining balance method). Up to December 2016, a total of BDT 4,176 million (US$53.54 million) has been disbursed under these three loan schemes in 150 ENRICH unions. Saving is one of the methods of capital formation for a household. An asset base is important for a household to lift itself from poverty. Therefore, a special savings scheme has been designed under the ENRICH for the ultra-poor households. From among them, female-headed households and households with disabled members are particularly eligible to join this scheme. Such a household is advised to open a bank account and deposit some money (at least BDT 100=US$1.28) into it per month for two years. The amount saved is matched by the PKSF, in terms of grant, at the end of two years, up to a maximum of BDT 20,000 (US$256), on the condition that the total amount will be used to acquire an asset (e.g. land, farm animals, skill upgrading of household members etc.) in consultation with the concerned PO and the PKSF. Such an asset base is likely to help a concerned household to move towards a better and sustainable socio-economic future. As of December 2016, 2,684 households of different ENRICH unions have registered under this savings scheme. Their total savings stood at BDT 17.8 million as of December 2016. Up to December-2016, 594 members have been given a total matching grant of BDT 8.26 million (US$103 thousand) under this savings scheme, which they have used to acquire affordable appropriate assets. The vegetable cultivation component encourages and helps small and marginal farmers in all ENRICH unions to cultivate vegetables of various kinds in accordance with the local cropping patterns and cropping seasons during the year in homesteads and elsewhere subject to availability of land. 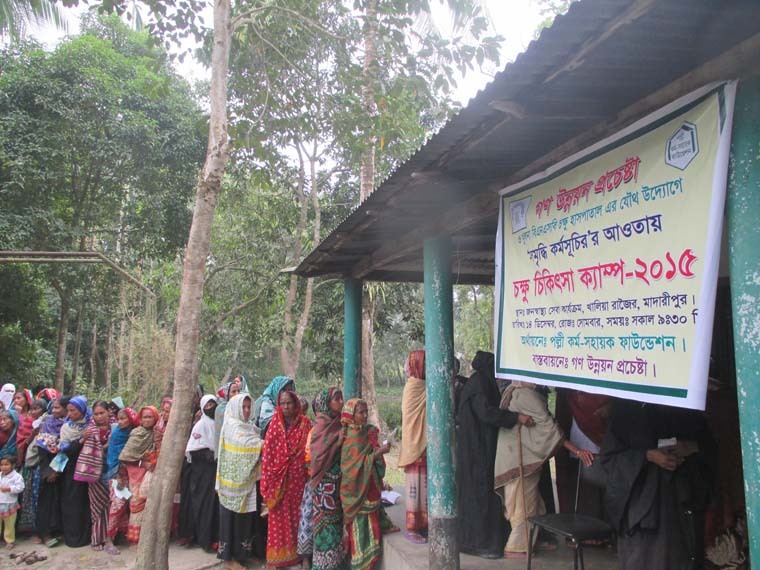 In the financial year 2013-14, seeds or saplings worth a total of BDT 10 million (US$128,200) were distributed to 50,000 households. Every household is given seeds and saplings of a minimum of five different varieties worth BDT 200 (US$2.56). Vegetables are produced for both home consumption and sale of the surplus for increasing household income, when produced on a small scale. Also, larger-scale market-oriented production is encouraged and facilitated. 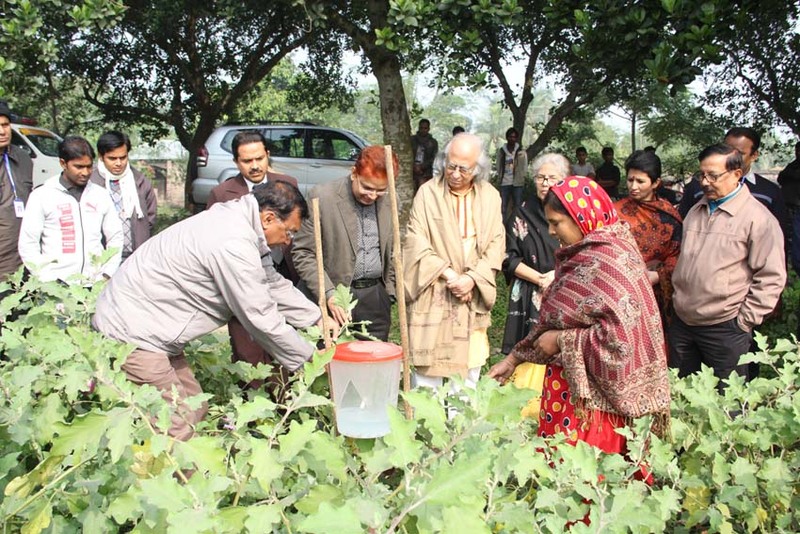 Medicinal plant cultivation is one of the innovative actions under the ENRICH, along with various other IGAs. A household can earn up to BDT 2,500 (US$32) per month by cultivating about 1,200 ‘bashok’ plants on 10 decimals of marginal lands. The life span of the plant can be up to 20 years. 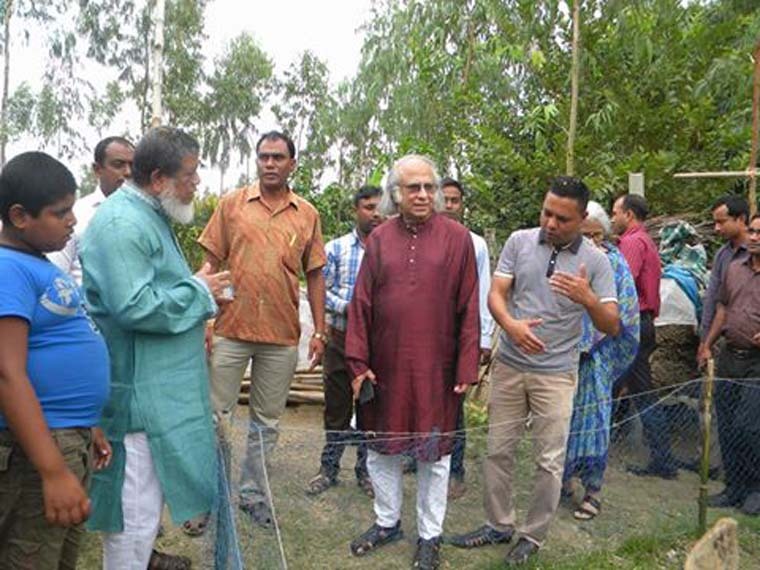 An initiative has been undertaken to promote the cultivation of medicinal plants, primarily bashok, in the home yards of the ENRICH households as well as on any fallow land they have access to, as a means of increasing household income by selling of this raw material to local pharmaceutical industries. It has been found that the domestic medical companies import a huge amount of bashok leaves every year. To the extent domestic production of bashok leaves meets the domestic demand for it, foreign exchange spent in importing it will be saved. 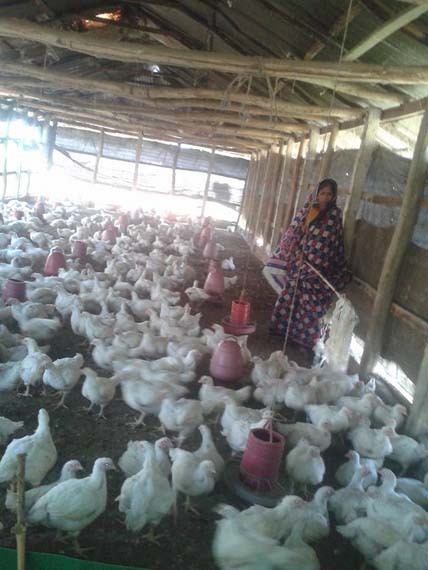 In general, however, livestock (cows, goats) and poultry rearing and fish culture are supported by extending necessary financing and ensuring proper feed, environment, and health services, as per the interest in and commitment to such activities expressed by the members of the households under the ENRICH. Cultivation of rice and other commodities and planting of fruit and other trees are also supported, as appropriate. A major emphasis is given to awareness raising regarding climate change and its impacts. A book has been published by the PKSF in Bangla and widely distributed for the purpose. In addition, other methods such as group discussions and interactions with households are used to that end. Some adaptation activities such as raising the plinths of houses and planting of trees and bushes for protection of houses from strong winds and also some mitigation activities such as installation of solar home-systems and the use of improved cooking stoves are encouraged and facilitated. Solar home systems are provided to the households without access to greed electricity, which help the households to improve the living conditions of the household members. Improved cooking stoves, as mentioned earlier, protect those who cook for the family from possible health hazards that may caused by the conventional cooking methods. Other climate actions that the ENRICH can help implement at the local spaces are being looked into. In relation to social capital formation under the ENRICH, the process begins from the household. All members of a household are encouraged and facilitated to work in conjunction, while each member performs their specific responsibilities. Children, aged people, pregnant and lactating mothers, and the sick are given due attention, as should usually be the case in a family but is often not so in practice. Under the ENRICH, this is encouraged and facilitated. The preparation of family development plans in consultation with all members of the households sitting together boosts cohesiveness among family members and, hence, family level social capital. Members of the community are encouraged to meet and socialize in ENRICH centres or elsewhere and undertake joint activities for common good. The ENRICH tries to work in coordination with other service providers, both government and non-governmental institutions, in the particular unions, wherever possible. Liaison is maintained with local people from all walks of life to help create a conducive local atmosphere for promoting the wellbeing and welfare of all. A youth development component has been specially designed to help the youth acquire skills in accordance with their respective aptitudes and, at the same time, be imbued with human and social values. That is, the purpose is to equip them to find employment on the one hand and help create healthy social environment in their locality by getting rid of such social ills as child marriage, teasing of girls, violence against women, child labour, dowry taking, drug addiction. At the same time, they will also help raise awareness in favour of ethics, minority rights, and fairness. Regarding employment, efforts are made to create both self-employment and wage or salary-based employment opportunities. Those who choose self employment opportunities are assisted with market information, access to appropriate technologies, and marketing of their products. For salary-based employment, the job linkage initiative within the framework of the ENRICH youth development component maintains liaison with different employers and organizes job fairs by bringing potential employers to interact with unemployed youth. Job fairs assist the young unemployed to find jobs. Through such intermediation, a total of 1,093 young individuals of different ENRICH unions have, as of June 2016, found employment opportunities in G4S, PRAN-RFL, The ACME Laboratories Ltd, etc. The PKSF has developed a training course entitled ‘Right Decision Making Magical Skills’ to help the youth make the best possible and informed decision when looking for jobs. Under the ENRICH technical and vocational training policy, various types of skill training is being provided to the youth. Training provided up to June 2016 is as follows. In 39 batches, 602 trainees have received training in 16 trades, which are mobile phone servicing; radio repairing; television & computer servicing; electric house-wiring; fitting and servicing of industrial electric works; servicing of refrigerators & air conditioners; diesel, petrol & generator mechanic; tailoring; plumbing & pipe fittings; computer application; driving; electric fan, motor & transformer rewiring; food & beverage preparation (shef); food and beverage service; apparel merchandising; house keeping; pattern making, cutting & grading. A token contribution of 10% of the total cost of training is borne by the trainee and 90% by the PKSF through the ENRICH as grant. A few other training courses have already been piloted successfully and included in the skill training portfolio under the ENRICH. Demand for such training courses is increasing, which will continue to be catered to. 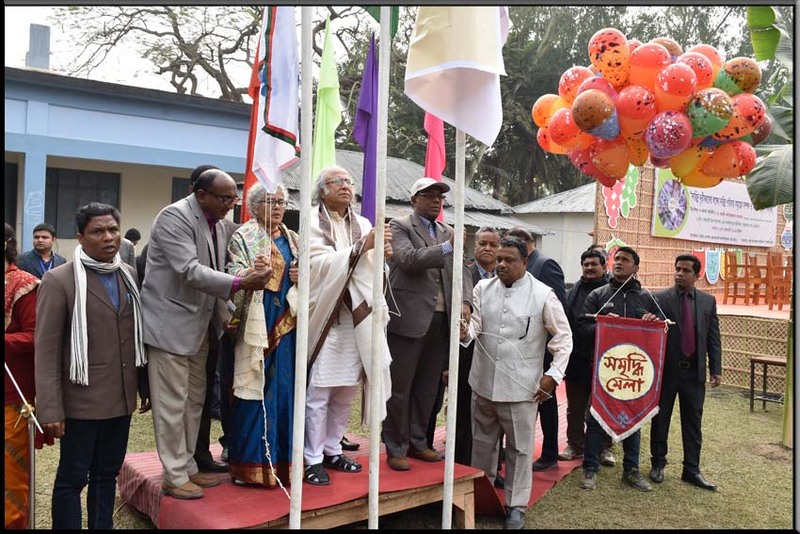 An initiative has been undertaken to promote sports and cultural activities, which are important ingredients of fuller and richer human lives, among children in educational institutions and other appropriate facilities. This activity is at the pilot phase, which covers 9 ENRICH unions out of 150. It is very encouraging that children are participating with enthusiasm in this programme and school authorities, teachers, and parents are supporting it. From the ENRICH focus on the best utilization of the existing resources of each household, the concept of establishing ENRICHed homes has emerged. The idea is to utilize the homestead land to the best extent possible through proper planning, taking into account the amount of land available. An ENRICHed home contains house(s) for the members of the family to live in and also to use for relaxing and entertaining. There is a sanitary latrine and, usually, a tube-well for drinking water. 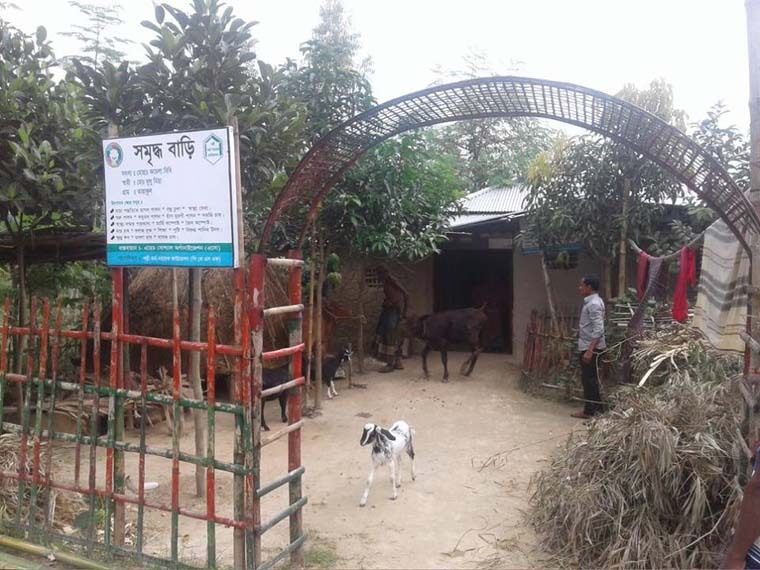 Economic activities conducted at the homestead include livestock, poultry, and pigeon rearing; cultivation of vegetables, and lemon, sajna, fruit and other trees, and medicinal plants. Flowers are cultivated to create an aesthetic environment. There is also either a solar home-system or a biogas plant. 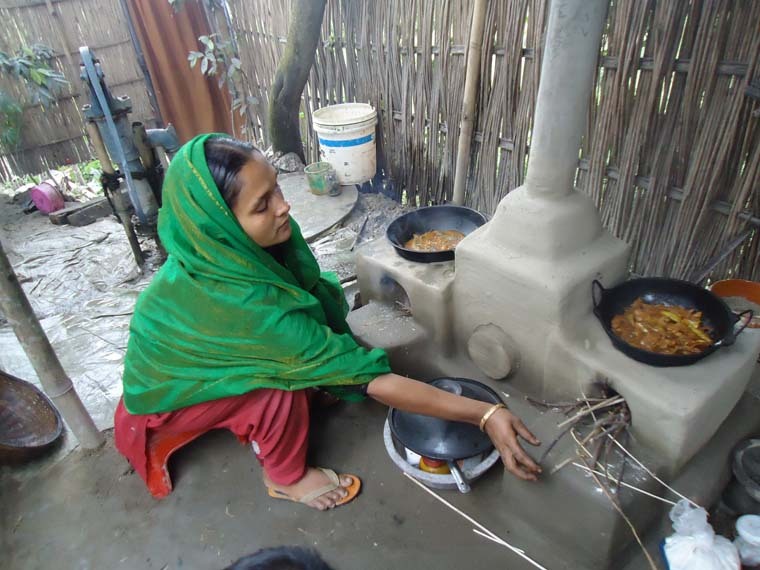 An improved cooking stove for cooking without being affected by smoke is used. Environment-friendly fertilizer vermi-compost is produced by the household for own use and/or for sale. Of course, all ENRICHed households are covered by the ENRICH education, health, and all other components. Up to June 2016, a total of 1,205 ENRICHed homes have been established in different ENRICH unions. Establishment of ENRICH homes is expanding fast, both as a result of pursuation and demonstration effect. An ENRICHed household consumes, as required, the various items produced at the homestead, and sells the surpluses. An example may be cited. 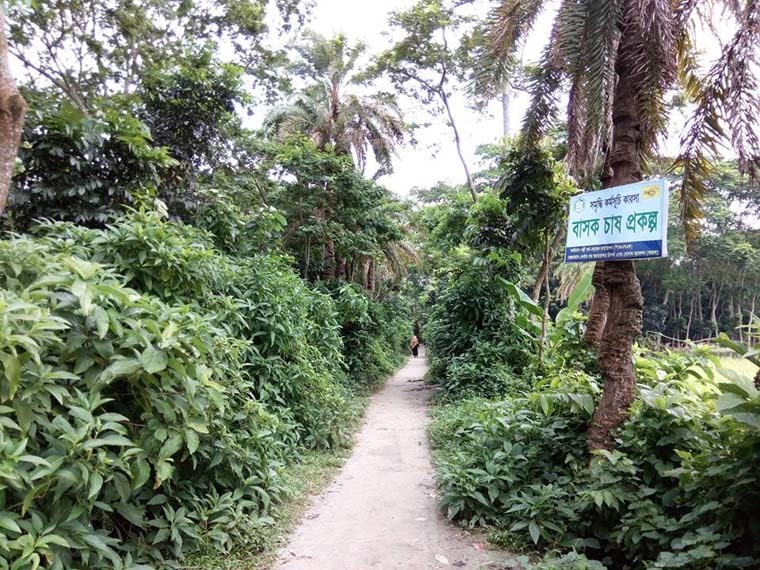 It has been found in Shimanto union of Chuadanga district that from a tiny homestead land of only three decimals, about BDT 10,000 (US$128) is being earned per month by a family. The income thus earned from the homestead land gives the family a solid base to improve their living conditions—towards poverty eradication and beyond, as the case may be. Extremely disadvantaged people such as the disabled, dalits (the so-called untouchables) and street cleaners, beggars, female agricultural workers, and people living in such areas as haors, baors, and hills are given special attention to enable them to break out of poverty sustainably. The particular issues faced by each group are identified and addressed. One example may be cited here, which is about rehabilitating the beggars. First of all, genuine beggars are identified in a union through a thoroughly investigative process. It has been found that a lot of motivated work is needed to convince a beggar to give up begging and agree to be rehabilitated into a normal life. In some cases, it takes months of counseling and convincing. 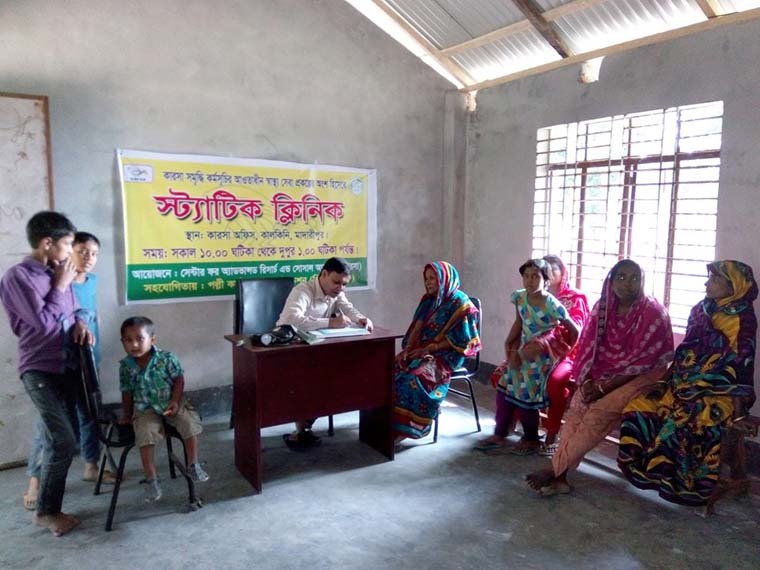 Once, a beggar, a man or a woman, agrees to be rehabilitated, the PO officials sit with them to assess their health conditions and other circumstances and what they would like to take up in terms of economic activities. Once that is settled, the beggar is given a grant of BDT 100,000 (about US$1,250), but not in cash. The amount is deposited in a Bank Account, operated jointly by the grant recipient and an official of the PO. The recipient is in fact given support in kind, using the money from that account. 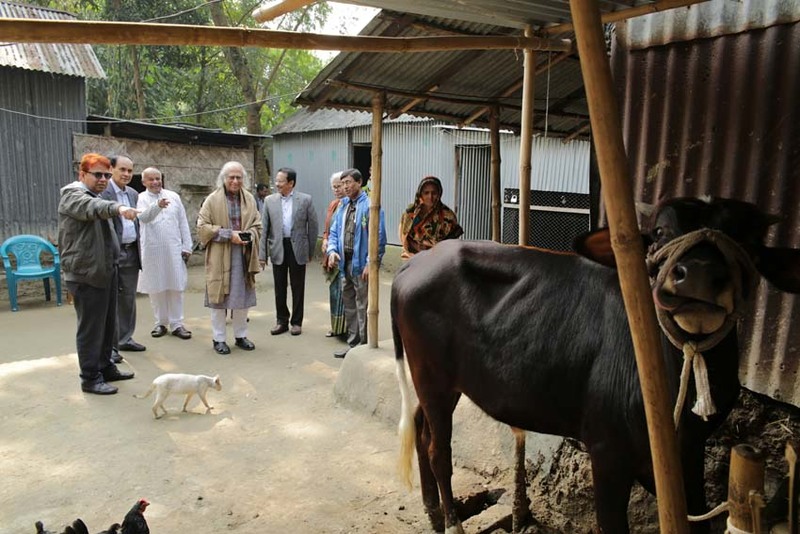 If the beggar has a place to live, the house is repaired if and as required or if person has land but not a house, a small house is constructed for her/him to live in and also to accommodate the livestock (such as cow, goat) provided as an income earning source. If the beggar has no land, a piece of land is found for her/him in khas land or through donation by a local generous person or from a relative and a house is constructed for the beggar. The beggars have chosen such activities as livestock, grocery or other types of shops, auto van, paddle van etc. Several of those and other appropriate items can be given to a beggar as long as the total cost does not exceed BDT 100,000. The progress of the beggars under rehabilitation is strictly monitored. It is arranged that the Union Parishad (UP) chairman or a UP member or a distinguished local person agrees to help a beggar as her/his mentor. So far, 625 beggars from all 150 ENRICH unions have been rehabilitated and they are now living with dignity in society. The full rehabilitation process usually takes one to two years. So far, there has been no drop out. Once rehabilitated, they are known as rehabilitated members or enterprising members in accordance with their newly acquired social dignity (and not as rehabilitated beggars). The purpose of the PKSF in relation to rehabilitation of beggars is to demonstrate that beggars can be fully rehabilitated and how can that be achieved effectively within a year or two at low enough costs. It is expected that other service providing agencies, even well off individuals will come forward to help such severely disadvantaged people to get out of poverty and live in human dignity. Other types of severely disadvantaged people are also being rehabilitated, appropriately addressing the specific problems and adverse circumstances faced by them. This activity was initiated about two years ago. First, the genuine freedom fighters living in the ENRICH unions were identified through appropriate verification. 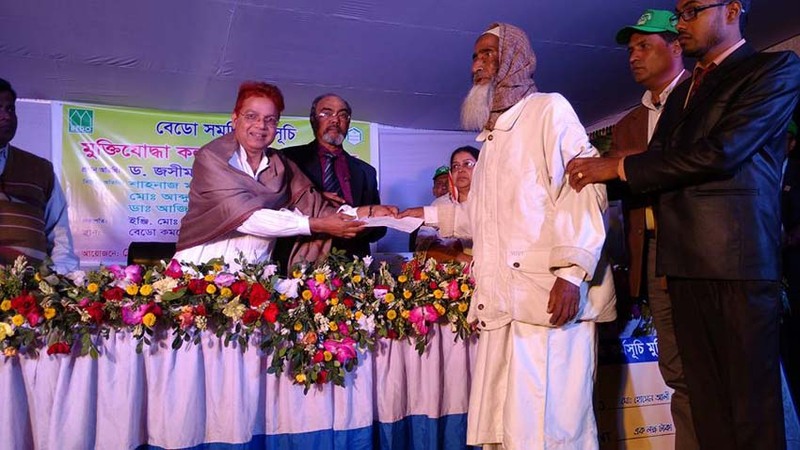 They were all recognized for their magnificent contribution to the Liberation of Bangladesh by sending them letters of facilitation and thankfulness. All of them have since brought under ENRICH health programme, providing primary health services and medical advice free of cost. The ENRICH regular medical check up and referral services are available to them on priority basis. At a later stage, a process was put in place to identify those freedom fighters who, unfortunately, are in serious socio-economic disadvantage. This identification activity is in progress. In the meantime, steps have been taken to rehabilitate 15 severely disadvantaged freedom fighters, all in one union. The freedom fighters receive government assistance of BDT 10,000 a month each. But, for many, this is not enough to meet their increasing medical expenses in addition to the cost of living of their families. The PKSF ENRICH is trying to fill up the gap to help the concerned freedom fighters to live with dignity. An ENRICH centre is being established in every ward of the 150 ENRICH unions. On average, there are nine wards in a union, which implies that total number of ENRICH centres in 150 unions will be 1,350. So far, 167 centres have been established in 20 unions of the first phase of 21 unions. This centre is serving as a hub for people of the ward to socialize and liaison with one another. The centre is, in fact, a multipurpose entity. As a matter of policy, the land is provided by the local community and the PKSF meets the costs of the building so that there is an inherent local ownership. Each centre is managed by an 11-member ward committee, headed by the elected member of the concerned Union Parishad from that ward. The other members are generally drawn from senior citizens, local elites, teachers and youth of the particular ward, and ENRICH implementing Partner Organization (PO). The committee meets once a month to discuss development and social issues of the ward that need attention. They also review the progress of the ENRICH activities and identify slacks if any and suggest how best those may be addressed. 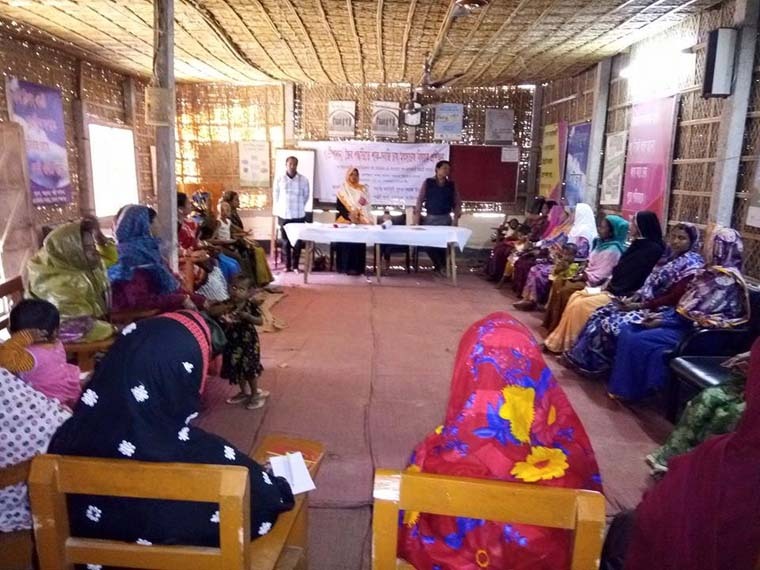 Joint meetings of all the ward committees in a union are held twice a year under the chairmanship of the Chairman of the Union Parishad for the purposes of briefing, coordination, and guidance. 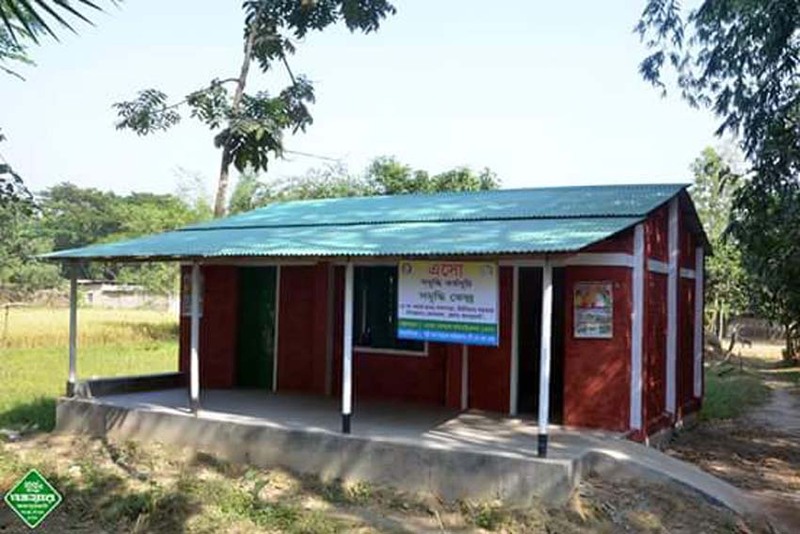 The centres are used for various purposes such as static and satellite clinics, local dispute resolution, youth training, and generally as a facilitating outfit for social capital formation in the respective wards in terms of mobilization of ideas, shared responsibilities in undertaking community actions for development, and uprooting social evils such as child marriage, teasing of girls, drug addiction, and so on. 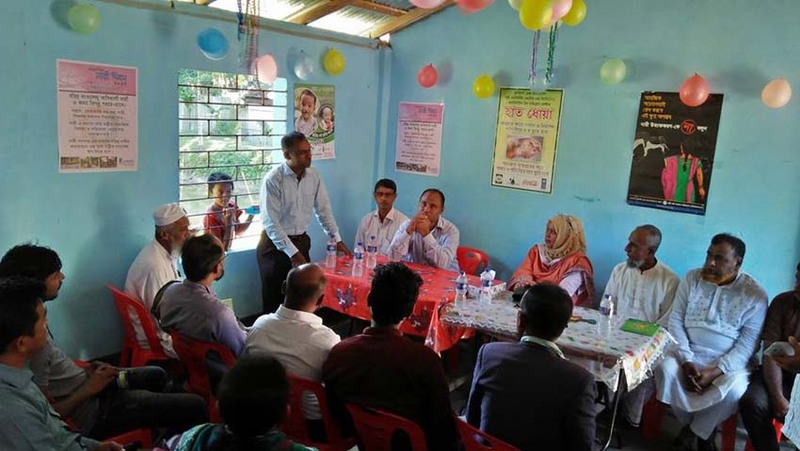 An external evaluation has found the ENRICH centre to be a unique and effective innovation for the creation of solidarity and cohesiveness among the community members in relation to the socio-economic transformation processes in the area. Currently, the construction of another 234 ENRICH centres in 26 unions is underway. Phase by phase, such centres will be established in all wards of the 150 ENRICH unions. 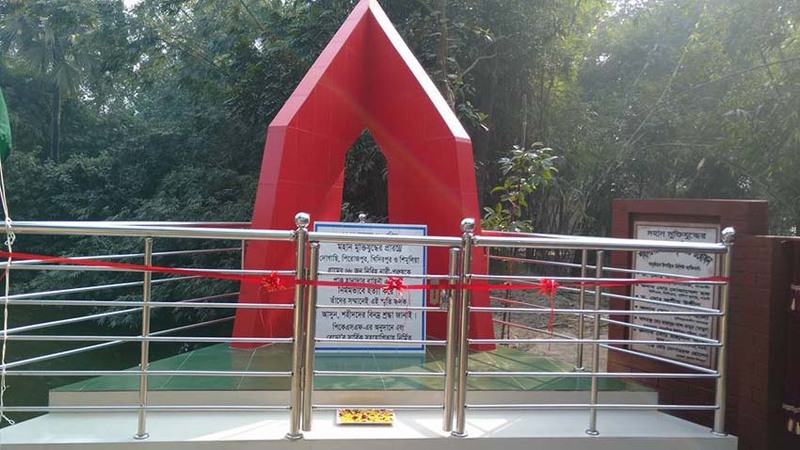 Under its union/community-level development component, the ENRICH promotes repairing or building culverts, bridges, and sanitary latrines and shallow tube-wells in public places such as schools, colleges, madrasas, mosques, temples, and libraries. Up to December-2016, 3,696 community level sanitary latrines; 30,801 household level sanitary latrines for poor households; 2,815 tube-wells; 71 deep tube-wells; and 35 Pond Sand Filters (PSF) have been built or repaired in various unions. 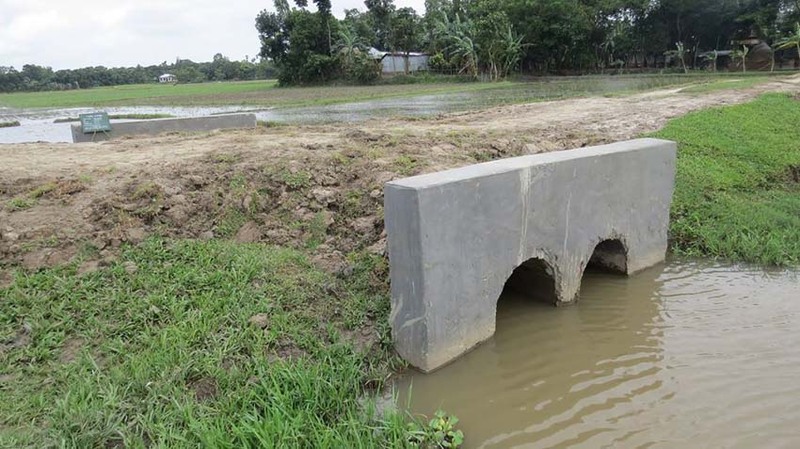 Moreover, 1,555 small culverts/bridges and 1.5 km of road have been constructed. Also, 13,900 more sanitary latrines are now being installed in poor households which are still without such latrines. As indicated earlier, when a particular community or union level action is identified, the ENRICH takes appropriate steps to accomplish it if it is within its capacity; otherwise, efforts are made to identify the appropriate service provider and mobilize its support for the purpose. 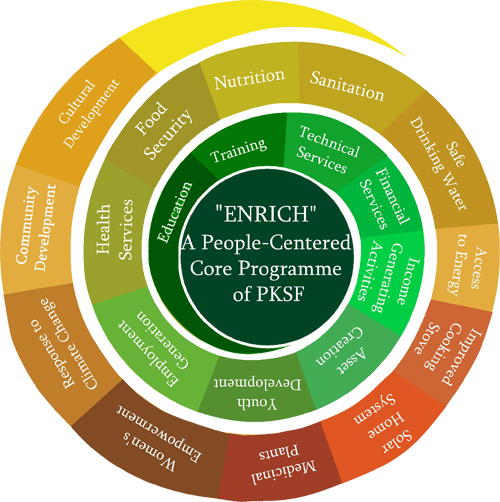 The PKSF undertakes periodic evaluation of all its programmes and projects including the ENRICH, in order to identify what works best and what does not. If there are mission drifts or performance slacks, steps are taken to strengthen the positives and introduce corrective actions where necessary to ensure the best possible results. The PKSF uses on-site and off-site monitoring mechanisms to oversee the ENRICH performance. Different indicators related to, for example, access to health services, education, sanitary latrines, safe drinking water, financial services, IGA training etc. are used for monitoring outcomes of the programme. On-site monitoring is carried out by the PKSF’s ENRICH Unit and Operations Department. Senior officials regularly visit the ENRICH unions to assess performance and financial transactions. On these visits, they also conduct direct discussions with the members of the participating households, the chairmen and members of the respective union parishads, and concerned PO officials to obtain feedback relating to the operation of the programme. The insights gained are used to strengthen the programme and modify aspects if found necessary. The off-site monitoring using MIS also helps improve management effectiveness and accountability. Each PO sends monthly MIS report to the PKSF, from which data are entered into PKSF’s database and analyzed. A component-wise target and achievement report is then generated and presented to the PKSF Management and to its Governing Body. The POs also carry out evaluations of their own, using their internal mechanisms combined with the PKSF guidelines. An external evaluation was conducted by the Institute of Inclusive Finance and Development (InM) to provide a thorough report on the ENRICH with respect to both process elements and outcomes. It shows highly encouraging results in respect of the key components as well as in terms of overall progress relating to both the mission and vision of the ENRICH. Sluggishness found, particularly in two important respects, has been effectively addressed. A further external evaluation of two of the first 21 ENRICH unions has been carried out by the InM, particularly to assess the impacts. It has been found that the programme is making solid and steady progress in relation to its overall goal of poverty eradication, sustainable development, and achievement of humanly dignified living standards by the programme participants. The few slacks identified are being addressed to further strengthen the operation of the programme. In concluding, it may be confidently stated that the multidimensional integrated approach, that the ENRICH is, has generated a momentum for sustainable reduction of poverty in its multiple dimensions and sustainable beyond-poverty development in the ENRICH unions. The programme participants, both women and men, are rapidly graduating to a humanly dignified living. The ENRICH is a flexible programme and innovations are encouraged for further enriching the ENRICH programme. It appears from the way things are shaping up on the ground that the local socio-economic and governance dynamics will flourish enough in 5-7 years in the ENRICH unions from the programme’s initiation, depending on the initial conditions of the unions, to let the ENRICH to begin to hand over management of aspects of the programme to the local mechanisms, transferring more and more responsibilities in an orderly fashion over time. But, the PKSF will maintain its presence in the ENRICH unions for as long as necessary, albeit, in an increasingly reduced role.